I'm not an Oprah fan. If I watch an episode of Oprah it's usually because she has a guest that I enjoy or because I stumble into it. Last night, I stumbled into an episode about "bests". There was a segment about the "best jeans" for curvy bottoms (CJ by Cookie Johnson). And even one about the "best job" (a travel writer). But the one that stuck with me was about a "flash mob" that was organized for Oprah at a Black-Eyed Peas performance in Chicago. One of the participants described that he felt a feeling of "joy rising" during the event. I thought it was poetic. I've definitely had those moments. 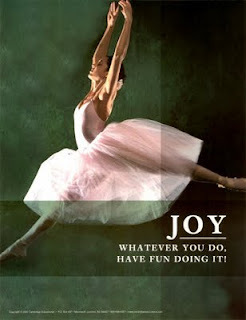 Where you feel connected and joy seems to be bubbling inside you. A lot of those moments, I've had while performing. I've even had a few of those moments with my students while watching them do presentations or interact with each other in positive and supportive ways. And sometimes I've had those moments while sitting calmly with my thoughts. My only concern is that those moments have been fewer and far between lately. I think it's something that everyone should experience. And it should be often because it's sublime.